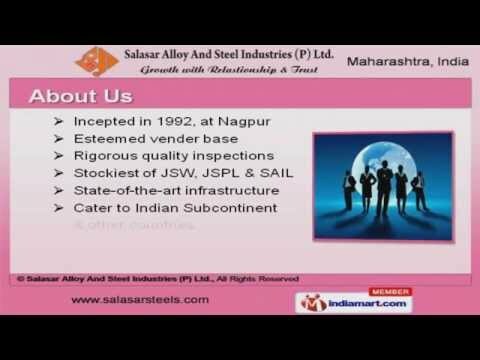 Welcome to Salasar Alloy And Steel Industries (P) Ltd.Manufacturer & Importer of Steel Alloys & Steel Products. The Company was incepted in the year 1992, at Nagpur. Rigorous quality inspections &State-of-the-art infrastructure help us to cater Indian Subcontinent. Market competitive prices, Dimensional accurate products & diligent workforce make us stand apart from also-rans. We offer a wide assortment of Wire Rod, Round Bar Grades, Round Bars & Wire Drawings. Our Wire Rod & Round Bar Grades are best in the industry amongst others. We offer Square & Round Concast Billets that are nothing but the best solution for all your needs. Wire Drawing Assomac Machines & Facility offered by us are widely acclaimed in the market. Our Wire Rod, Round Bars & Latest Stock Lists are available at affordable prices. We also provide Low Carbon Ferro Manganese Powders that are a class apart.